Bamboos are members of the grass family (Poaceae) in the subfamily Bambusoidiae, a group characterized by thickened, woody stems known as culms. Native to mostly tropical and warm temperate regions of the world, bamboos range from diminutive groundcovers less than 20 cm tall to tropical forest giants 30 m tall with culms more than 30 cm in diameter. The culms of most species are hollow between the nodes, but there are numerous examples of solid-stemmed bamboos. Bamboo leaves are typically evergreen, but some New World bamboos native to seasonally dry habitats have deciduous leaves. A few Chilean species, in the genus Chusquea, are tough enough to survive cultivation in Vancouver; otherwise, this is generally the limit of cold-hardy New World species. Asian bamboos, on the other hand, are much more numerous and diverse in cooler regions. In contrast, there are some 15 genera of bamboo native to China, Japan and the Himalayas, and perhaps 60 or more species that could be considered cold hardy. However, variation within bamboo species is considerable and many of the hundreds of selections could potentially be cultivated in the Garden. There are basically two kinds of bamboos based on the characteristics of their rhizomes (horizontal underground stems). Pachymorph (literally, thick shape) rhizomes are characteristic of the clumping bamboos. The rhizomes of these bamboos have short internodes and multiple branching tips, and the clumps are usually dense. Running bamboos have what are known as leptomorph (lepto = narrow + morph = shape) rhizomes, which have long internodes that do not branch freely. People are often warned against planting running bamboos because of their aggressive tendencies. Indeed, running bamboos are infamous for invading neighbouring properties and some have even been known to exploit cracks in foundation walls and to spring up inside people’s houses. In the Garden, there is not only plenty of room for these magnificent plants, but the combination of root competition from established conifers, summer drought and our impoverished, shallow soils tends to severely limit their growth away from irrigated areas. Flowering in bamboos is roughly synchronous among the individuals of a species. In other words, all individuals of a particular species will generally flower at the same time – within a few years – regardless of where in the world they are planted. Cycles vary, but it is not unusual for a bamboo species to live for 50 years or more between flowering episodes. In most bamboo species, flowering triggers a slowing or even complete cessation of growth. Some bamboos are completely monocarpic, meaning the entire plant dies after flowering. However, this is not universal, even among species that are supposed to be monocarpic. Because bamboos rarely flower, in the past many species were classified based on leaf and branch arrangement, and culm and rhizome characteristics. However, the classification of flowering plants is seldom based on vegetative features alone as flower structure is usually a more reliable indicator of relatedness. Thus, over the past few decades, as more bamboo species have come into flower along with recent advances in molecular genetic analysis, botanists have been busy with realignments in bamboo taxonomy (classification and naming). Nevertheless, vegetative features—in particular, leaf and stem sheath characteristics, branching arrangement and culm qualities—are often excellent aids to identification. The bamboo collection at UBC Botanical Garden is comprised of both older, established plants and a number more recently acquired. The majority of established stands are Japanese species and selections. Some are as old as the garden itself. Today, however, most of the bamboos in the Garden are Chinese in origin. Many are relatively new to cultivation. A large proportion of these came to the Garden as a gift from Matt Lang and his company, Bamboo Botanicals Garden and Nursery. Bamboo Botanicals has partnered with the Garden to support ongoing research and teaching and bring a wider range of bamboos to the public’s attention through display in the David C. Lam Asian Garden. A number of exceptional bamboos were also donated by Samuel Normandeau. 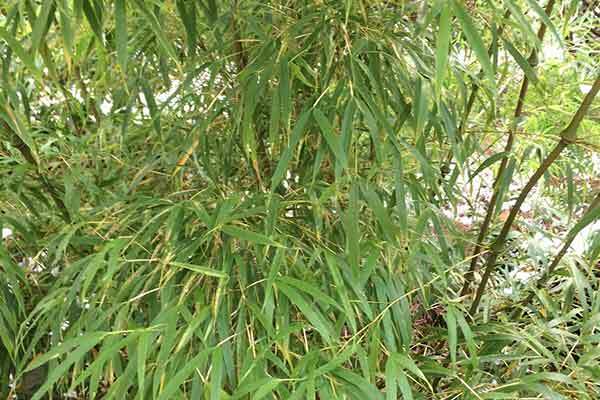 There are approximately 50 different bamboos in the Garden, roughly half of them runners.